Barbara Corcoran Gets Into Crowdfunding - News from our Podcast Series "The Entrepreneur Show"
Crowdfunding - Can You Raise a Million Online? Just as we began our new biweekly podcast: The Entrepreneur Show with a group of Equity Crowdfunding companies, we got the news: "Shark Tank" regular and real estate mogul, Barbara Corcoran is joining the board of one of our panelists' company, Rock The Post. So kick back and listen up to what's happening in the crowdfunding space and how that could change marketing - and not just capital-raising - everywhere. You will meet Alejandro Cremades (Rock the Post), Jeremy Andrews (Smart Money Entrepreneurs), Alex Fair (Medstartr), David Post (Benamin Bakery) and Serena Walker (Athena Business Institute). Do you really want to know what Investors think of your idea? The chances are they won't be telling you. But when you look at what they have to say about these companies, you might get a good idea about what they might say about yours. Or you can review the summary of our forthcoming book Are You Fundable? at the iBreakfast blog. It has been downloaded over 6,000 times! Congratulations to the winner, Harold Baum of DynaTabs. He will be attending the PrivateEquityForums.com event at the Yale Club. Defendcall is an emergency call system that turns your cellphone into a personal alarm system. 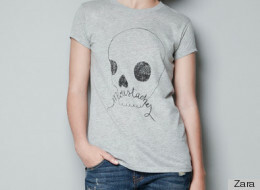 It is best suited for campus environment. Judges liked this idea and considered this a great presentation. But they were concerned that it may not be unique enough (add features!) and suffers from the "Catch 22" issue: can you open your phone in time in an emergency? Then, there is the key problem - this product is sold to schools and investors are extremely leery of startups that are sold to education or government because they are too many people who can say no and the sales cycle is tortuous. Votopin is a popular voting system that employs an intuitive visual interface. Another good presenter whose challenge is to focus this product on an area that would most readily adopt it. Otherwise, a voting system at this stage in the the internet is just too broad and too fully, if improperly served, to enter. The idea of turning it into a community is overly road and would either be problematic or too expensive to achieve. Villij - a CRM and community development site for independent stores. Dynatabs - the unexpected winer! Dynatabs is a company that sells supplements int he format of a "ministrip." and has a process patent that can be license for other pharma companies. Arguably, the least polished presentation of the evening but the one with the products and the products won! AVINI - High definition sound for hi-Def TVs and other digital devices. The promise of this product is marvelous however it lacked a demo. Until then, we'll never know. Jollify - a web service that "frames" your videos with a theme, creating a video equivalent of a snapshot or postcard. The judges were impressed with the idea but felt there need to be more of a solution to the problem of too much video that will never get watched. It may have been a family trip that took me to Europe but the lessons of entrepreneurship kept pouring through. Since my last trip to the Mediterranean took me to Israel, it was hard not to compare the endless "For Sale" and "To Rent" signs in Spain and France - not to mention the abandoned construction sites vs the booming Israeli economy where tech giants like Microsoft and Intel plaster their names on buildings everywhere as a way to hire engineers. the Euro but still a bargain compared to France and Switzerland). Yet, as an entrepreneur who wonders how countries reinvent themselves in the new economy, peering into the culture is endlessly fascinating and there are surprising lessons to be learned. In France, the talk was about taxing millionaires and the scandal over former President Sarkozy's apparent money-grubbing from the L'Oreal heiress, Liliane Bettencourt (see 10 richest list below). 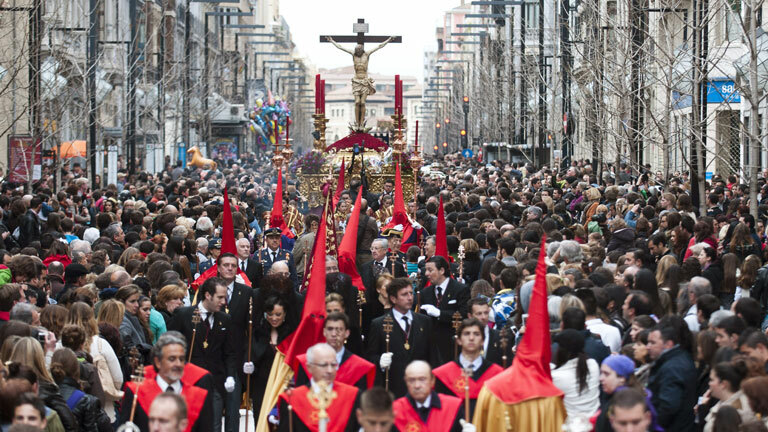 In Southern Spain, it was about finding new tourists and the spectacle of Semana Santa - Easter Week. In Israel, it was Obama's visit and the backlash over the quantity of multinational companies in Israel. There are so many Israelis working for them that the public has begun kvetching - enough to inspire a major newspaper to calm them down with a Passover article about loving thy multinational. Southern Europe should have this problem. Is it possible that what binds Spain culturally may also be what holds them back? What has long conflicted them may also be what holds the most promise, economically. I am saying this after spending days viewing the Easter parades which are a mass wonder. Here, people vie to join brotherhoods and dress like grand wizards of the KKK, endlessly hauling around massive tronos – precious-metal encrusted altars with Jesus or Mary – in a swaying lockstep with well rehearsed processional music to follow. You get to notice that people in these groups seem to stand several inches taller than the spectators, suggesting an elite group of some kind. I'm guessing taller is better if you want to go far in Spain. In any case, these multiple processions hold the nation in a thrall as it attracts visitors from all over Spain and filling TVs with wraparound coverage. As for the dining that followed – it is a bit of challenge to have anything other than tapas, ham or chorizo. Spain is a very convivial country and once the solemnity of the marches had passed, the fascinating old streets lined with tiny bars and restaurants erupt in conversation. When we spent time chatting with people, both in Paris and the South of Spain, everyone we met had a company job and more often than not, with some branch of the government. With as many as 50% of the youth unemployed in Spain, and France suffering a similar, though less extreme recession, we were obviously hanging with the winners. In Israel, everyone we ran into from family to former employees were entrepreneurs who had gone public, sold their companies to IBM or were working on the next big healthcare product. If they had a job, it was with an entrepreneurial company. Since we were visiting my daughter on her study abroad in Granada, Spain this was hardly scientific but it is indicative. Even so, it would be hard to tell that either Paris or Spain was suffering economically. The social net is broad in Spain. In France, you only see it in the hardscrabble tenements on the outskirts of town and the satellite cities on the way to the airport. In Spain, the giveaway is the mass of real estate signage and in the Costa Del Sol, it's concrete apartment skeletons and blocks of empty mansions waiting for new tax exiles and dubious businessfolk from northern Europe and Russia. What you don’t see, are the signs of new enterprise, innovation or hero entrepreneurs. Only Britain was able to boast that with sale by Nick D’Aloisio, the teenaged founder of the AI-based news summary app Summ.ly to AOL for a reported $30 million. It was encouraging when, at the Beauvais airport about 2 hours from Paris we saw a sign boasting of the siting of major food, bio and tech companies. It was only in Paris that I came close to an Entrepreneurs - in this case, something at the rockbottom of the ladder when a shabby-looking man in the Marais heard that I was from New York and asked how much it would cost to live there for months. He was a game designer who was looking to raise capital. He said there was no VC money in France - and my media friends concur - he wanted to know what his prospects were in NY. Israel, on the other hand was full of Angel money because it has cascaded down from the entrepreneurs who had made in big in the past 20+ years. Companies like Teva Chemicals have VC funds and they are very active in backing healthcare start-ups. In Spain, the government actually set aside a few hundred million euros to help failing businesses but - surprise, surprise - about half of the money disappeared into the hands of “agents” who were supposed to distribute it. Is it my imagination, or is true that socialism has a way of making bureaucrats act like "entrepreneurs” and the business class like serfs? What makes Spain so interesting is that it is the home of the most successful artist ever and the world's third richest man: Picasso and Zara’s Amancio Ortega. The world’s richest man, Carlos Slim, is from Mexico. The 2nd and 4th richest are our own Bill Gates and Warren Buffet followed by Larry Ellison the Koch Brothers (oil and steel) and the French perfume and fashionistas with the L'Oreal and LMVH fortunes. In the former Spanish colony of Mexico, Carlos Slim, a successful stocktrader, leveraged the Hispanic tradition of syndicates by buying them up when financially strapped, and going on to monopolize the communications industry, and then to becoming the world's richest man. Spain’s Ortega also harnessed the creative element of Spanish culture – design – arguably putting him, at some level, in the same class as both Picasso, the groundbreaking iconocast as well as the devoutly Catholic architect of Barcelona, Antoni Gaudi. It is a little more complicated than that: Zara is known as an expert copier of others' ideas and has no famous in-house designer - there are no stars, everyone carries the Zara trono. The fact that it originates from the same Galician region in the north as the former dictator, Francisco Franco is not entirely lost on the media either and the empire is known for its secrecy and lack of advertising. Picasso's genius is as much about art breakthrough as it is "improving" on others ideas. He is attributed by many, including Steve Jobs for saying, "good artists borrow, great artists steal." Finding Picasso's "victims" is as much a beloved pasttime of art historians as is the media finding Zara's supposed knock-offs. While Israel has no one in the Forbes top 10 or even top 100 list, it does have 17 billionaires which, if you scale the economies (7.5 million vs. 48 million) makes them extraordinary. If you throw in Sheldon Adelson (Comdex and casinos) and maybe Michael Bloomberg (financial data terminals) as honorary Israelis, you see how innovation-driven wealth has reflected well on their economies. Where Spain gives welfare to businesses only to stimulate bureaucrats, the US and Israel have, in critical ways, fostered the cascading effect of venture money. As a result, most stores in Paris sell clothing and then food. Unless you love fashion, you won't see much interesting in storefronts like you would in New York. Most restaurants in the South of Spain offer just about the same food choices. The cuisine is far from adventurous and nothing like Mexican at all – mostly bland and starchy. Despite all the seafood in the Mediterranean, if you want to eat a lot of its fresh bounty, and as seasoned as you like, you would be advised to go to a Chinese buffet. So why is Spain full of this art design genius, incredibly passionate about Catholic processions, remarkably civilized but mired in recession? The answer is probably the Moorish invasion which lasted from 711 to 1472. Just as Southerners talk about the Civil War as though it were yesterday, the Arab invasion is still alive in their blood. Most Spanish design until the 20th Century was essentially Catholicized Arab art. The fantastically decorated churches and the mass, weeklong processions are a living way to declare their independence from their past even though they are still living with its visual consequences - from the tiles, arches and lanterns to their sweetly gutteral g’s and x’s. Even gipsy flamenco is really Arabian music preformed by Spanish outsiders who often neighbored the Arab quarters. The Moroccan curio stores all over Granada constantly remind you of this with their intense piped music. And this Matisse "Blue Lady"
Picasso sees Braque's "Violin and Candlesticks"
Is Zara in a similar business to Picasso? It is a fair conclusion that what conflicted Spain the most, is also what defined and enriched them the most. 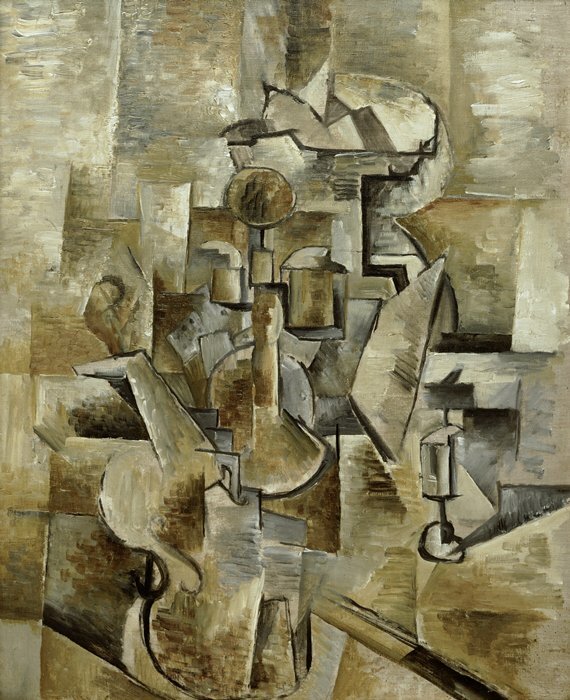 Even Picasso went from being a precocious artist to an iconic genius, essentially by reaching beyond North Africa and into sub-saharan African where he recognized their art not as primitive but as a way to extend beyond normal dimensions and consciousness. 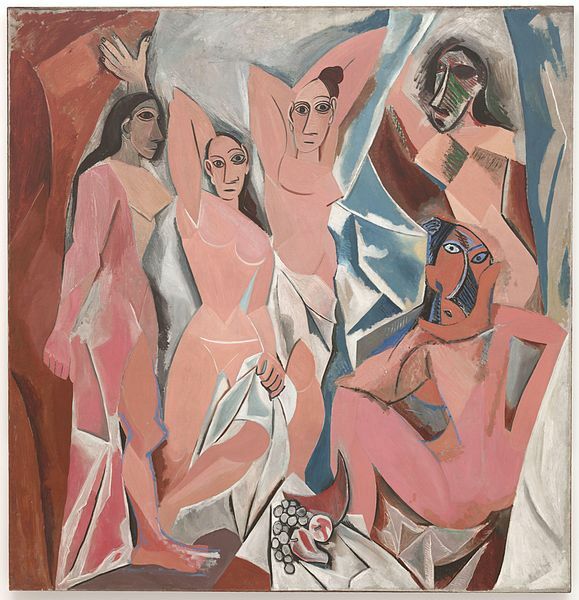 While Picasso has denied this, many experts date his transformation to a visit to the Musée d'Ethnographie du Trocadéro in the spring of 1907 where he was influenced by African and Tribal art several months before completing his groundbreaking Demoiselles d’Avignon. Spain, after all – and Picasso comes from the old Arab town of Malaga - is as close as Europe gets to Africa. Their genius seems to be in mediating it and apparently, Spain has recognized that by promoting the Arab-Iberian experience through a number of cultural, business and political initiatives. You also get a hint of the north-south division of the country - the industrialized Gaelic north (as in Galicia) and the creative, easy-going Arab-Iberian south. Creative or not, you still have to wonder if the apparent lack of variety in their food reflects a lack on enterprise - nitrogen-wielding, José Andres notwithstanding. While tapas bars have become popular in the US, I would argue it is only because enterprising US chefs have spiced up the offerings both literally and figuratively. Likewise, when it came to the music I saw plenty of gypsies playing without getting coins from the audience because, I would imagine, no one knew their songs. Doesn’t every tourist want to see a real gypsy sing Bambaleo on the streets of Granada? I’d bet these roaming troubadors would quadruple their take if they played what we wanted to hear not just what they happen to know. Sporting a do-rag wouldn't hurt their bottom lines either. As for the government, they are working hard to promote Eurotourism to Spain but when you riffle through an all-Russian magazine and see an ad for the Costa del Sol in English you get to wonder what happened to their translation budget? No doubt, Spain and France are more innovative than they get credit for but they are almost certainly not innovative enough. They don’t glorify their tech hero’s like we do. The binding culture is tied to the past and is often a flight from ancient conflicts. The Israelis, whether they like it or not live with conflict and that seems to have sparked their phenomenal tech innovation. (This opinion piece in the Wall Street Journal makes a compelling argument for just how much.) Perhaps it is time for these Mediterranean countries to compare notes and learn from each other. Since I didn’t hear anyone speaking Hebrew and matzoh was nowhere in evidence, I’m guessing the Sephardic Jews haven’t exactly been wooed back nor are they likely to have forgotten he past either. To complicate matters, Spain has worked hard to win friends in the Arab world, which was much represented among tourists. Even so, Spain still possesses the mining center of Milella and the town of Cueta on the Moroccan coast – which was the historic launchpad of the Moorish invasion so, while there is much trade, this remains an old dispute. One final point, according to my daughter, the young people have their own ideas about Spain’s future. Among them is a growing disinterest, even embarrassment over bull-fighting for being too violent. So here is my suggestion: Rubberized bulls horns, Kevlar toreador suits and as for the picadors – the guys who slow down the bulls by stabbing them with lances – tasers bro’. I’ve been told there is no chance of anything like this happening but if I could, I would gladly spend my days in a charming seaside village in the Costa del Sol. Hey, I’ll even open a bagel joint.